In this day and age, it is quite hard to believe that many large organizations still do things manually but they actually still do. Why this is so is a rather complex question to answer. The finance department is one of those departments where a lot of the tasks are manually inputted and with growing pressure on finance leaders and their teams to support the management team with good insights for decision-making, these laborious processes now come under scrutiny. A good example of a finance process that is manually accomplished is the journal entry. Most organizations today are quite embarassed to admit that their approach to journal entries is one that is not ideal. It is messy, it is prone to errors, and it is time-consuming. Most finance departments spend a significant number of hours inputting their entries into their excel spreadsheets and posting them. These are then printed and physically filed anywhere from 3-10 years depending on company policy. This archaic way of doing it makes tracking, comparing, and documenting daunting. Luckily, there are a lof of financial analysis software today that includes among other things automation of journal entries. For example, with cloud Performance Canvas Financials, you can automate the creation of journals, its validation, and posting from several sources together with all the other legacy systems in the company and its ERP system. 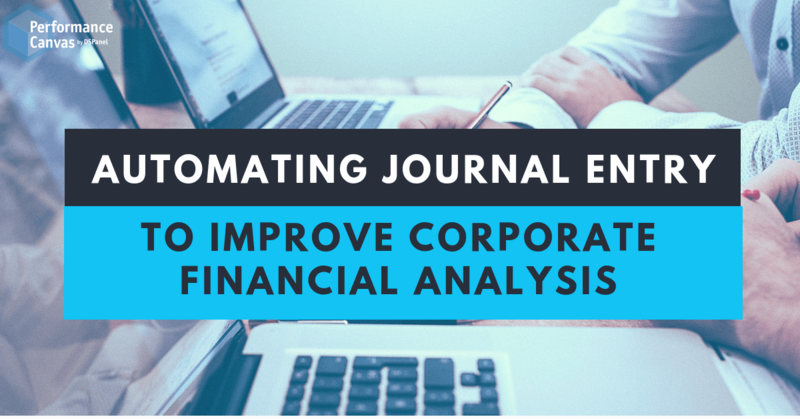 This automated way of handling journal entries in some financial analysis software optimizes the time spent in these tasks and reconciles differences. With some financial analysis software, you can even send emails to notify the approver in the approval process. Automated journal entries done in the cloud such as that offered by Performance Canvas Financials ensures you not only clearly see the bottlenecks in your process, you also increase the efficiency and effectivity of the process. Have you always wanted to automate your journal entry but you can´t quite work out how it will work for your company? Talk to one of our consultants or avail of a free online demo of our financial analysis tool called cloud Performance Canvas Financials. We will be delighted to walk you through where to start and what questions to ask your finance team. Visit www.performancecanvas.com or email info@dspanel.com for more information.